A young girl named Mato has just started school and is excited for all the new experiences she’ll have – in particular, new friends she’ll make. She hits it off with the shy Yomi right away, but there are some…complications. Mato, who has never been outright hated before, is in for a little shock when she meets Yomi’s…’friend’, the spectacularly unpleasant Kagari who is pretty thorough about making sure Mato knows her presence isn’t wanted. Meanwhile, spiffy girls fight in chessland – spiffy girls that have a connection to the ones in the ‘real’ world. Yes, it’s kind of difficult writing synopses for BRS. She's a terrible person, and yet I find her kind of adorable. Comparisons to the OVA are, of course, inevitable, so I’ll start this by saying that I think this new series is far better than the OVA was. The OVA’s biggest flaw was the complete lack of conflict for nearly half the damn thing – watching Yomi and Mato be BFFs for so long was cute and all but really rather dull to be honest. BRS the series has eliminated that flaw from the get-go by introducing conflict very early-on; the mysterious Kagari. Given Kagari’s absence in anything related to BRS I’ve seen far, I’m pretty interested in her character. There’s something quite compelling about her, even if most viewers are going to spend every second of her screen-time wanting to give her a slap. (She really just is that unpleasant). Who she is to Yomi exactly we obviously don’t know yet, but she represents the biggest obstacle in her and Mato’s friendship. The other major difference is that the series doesn’t even try to keep the BRS world a ‘mystery’ for very long, and makes it as obvious as possible that there are parallel world shenanigans happening here. I don’t have a problem with this, but I do have a problem with how it makes this obvious. The counselor at the school (another new character, who seems rather nice) completely unsubtle tells Yomi that it’s okay for her to get hurt because ‘someone else is taking all your pain for you, so the one who is hurt is not you’. Apparently, this is a Really Nice Revelation that makes Mato feel a whole lot better about Kagari’s hatred of her, but meanwhile, I was sitting there rather…confused. Why is this a good thing? “Hey Mato, don’t feel bad! Your pain goes to someone else! They’ll be hurting a whole lot, which is all your fault, but they’ll take all your pain, so it’s okay!” I really can’t figure out how the notion of indirectly causing someone else to suffer is meant to be a good thing, and the whole delivery of the line was just so ham-fisted and was overall the one thing that really annoyed me about this episode. But there’s plenty to like – as with the OVA, the imagery is beautiful. I noticed some people were complaining that the OVA had much better animation – but I didn’t actually notice any quality drop (or it just wasnt apparent enough to me. But I think it makes sense if an OVA has higher quality than a series). There are so many interesting colours – and use of colour- used in this show – in fact, the whole thing with ‘colours’ is something of a theme. And not just in the alternate world, there’s some really nice colourful parts in the ‘real’ world too, and the way they tie in the picture book the two girls like is quite lovely. Of course, I have to mention that the supercell Hatsune Miku song Black★Rock Shooter is used as the end theme, which I was completely stoked about. You might remember that I was a bit disappointed over the lack of it in the OVA, so it actually took me by surprise when it started. Furthermore, it’s a redone version with a much nicer use of Miku’s voice. As much as I like supercell’s/ryo’s songs, I don’t really like the overly ‘twangy’ way Miku’s voice tends to be tuned in them , so hearing it like this was pretty nice. 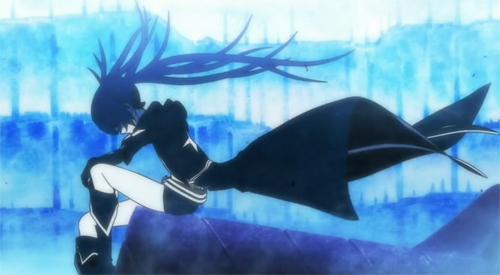 I’m really interested to see what kind of story the BRS series is going to become. I would love to blog this, but you know how it is; I can barely keep up with a 3 minute anime right now. (Speaking of which, I’m going to be doing those reviews every second week so I can do two episodes, if not just to bulk up the posts). But this first episode has made me want to keep watching; even with the little things that I wasn’t fond of. At the very least, even if the story ends up bad, it’ll still be gorgeous to look at. I know this was meant to be a serious moment but it was just so unintentionally hilarious to me.